The night started off well. I was in seat three (BB) at the first table and was dealt Qx6x. I stayed in through the flop, hit two pair, and pushed the other players out on the turn. My second hand was A♦3♦ and I made the wheel on the flop, with several hundred in pre-flop bets in the pot. 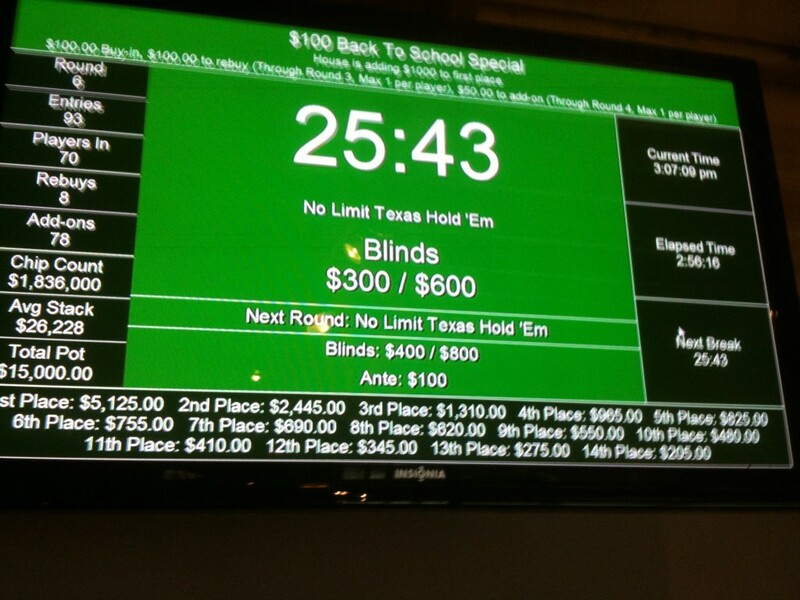 I checked, UTG2 opened for 400 and I raised to 1,000. He was the only caller. I bet another 1,500 on the turn and won. Ten minutes into the game, I was up 1,500 chips. I won another 400 holding AxJx. 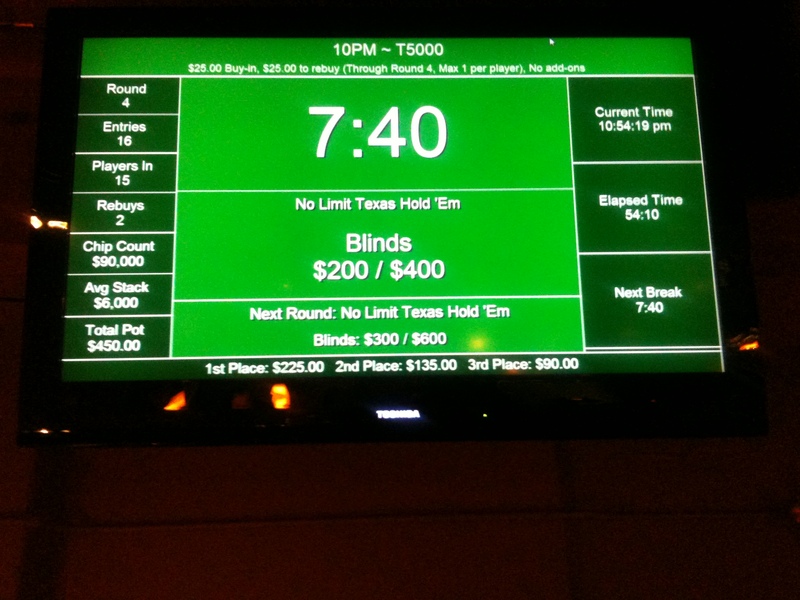 The board double-paired itself by the turn as I was heads-up with another player and we were checking it down, then with an Ax on the river I made a bet of 200 and took the pot. Q♥4♥ made me another small pot when I caught the low pair on the flop and somehow made the best hand. “Pair of fours” became the catch-phrase of the night but it marked the turning point in my fortunes. KxJx cost me 350 on one hand, then I dropped another 1,200 with J♥T♥ and a board that went all diamondy. The winner hit the nut flush on the flop. Still, I had 5,975 at the half-hour. 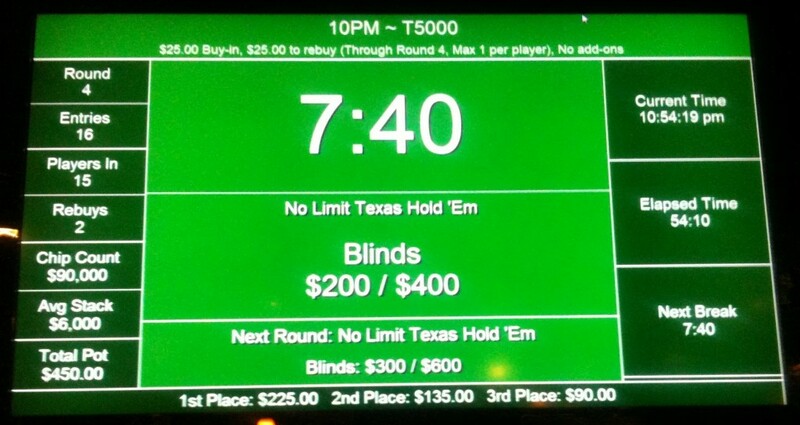 My real turn-around hand was calling an all-in of 2,800 (about half my stack) with J♦T♦. It was a classic race with two over cards (suited, in my case) against a pair, but when I went over the stats, I noticed something odd. Not only was the suited jack-ten combination favored over the pair of fives but it was the best suited connector hand overall against the lower pair, with an 8% relative advantage over even A♦K♦. According to the CardPlayer Poker Odds Calculator, something similar holds for 7x7x and lower, which is where the JTs combination has a better-than-even chance of winning. It didn’t in my case, however. I went all-in on my next hand, holding KxTx and enough chips to get everyone except the guy to my immediate right to fold. He called and flipped AxAx and my initial buy-in was gone. It was a turbo tournament, and we were already up to 200/400 by my re-buy. Raises were beginning to get even more aggressive. I called 1,600 with A♠6♠ and paired the lower card on the dryish flop, but folded to an all-in from three positions to my right. He took the pot, didn’t show, then announced it had been a “pair of fours”. I shoved the rest of my second stack shortly thereafter holding 3x3x. Got called by a player two seats to my left, he hit his ace on the flop and I was gone. Even a pair of fours wouldn’t have helped me. Fifty minutes. 16th of 16 players. -100%ROI. Every American should understand Poker. Nearly every American does understand Poker, or wants to. And it is part of the charm of Poker that it is so easy to understand. DV and I both played this game, in which the house added $1,000 to the pot for first prize just to make it extra juicy. I ended up at table 1, seat 8, and spent the afternoon next to R, the gent who beat me out of a first-place finish in a freezeout a few months back. DV ended up out in the hinterlands. My first move of any sort was as BB with Ax9x. By the turn, there were two kings on the board and when a bet of 400 opened, I folded. On SB with 8♦9♦, I caught top pair on the flop with my nine. The K♣ on the turn, two clubs on the flop and a bet of 400 from the same guy (seat 1) as the hand before and I folded. Shortly thereafter, I picked up A♠K♠ and raised to 350, getting four callers. The king paired on a pretty dry flop, I bet 1,000 and took the pot. Twenty-five minutes into the game, I was 625 chips ahead of starting stack. Three players were in for 350 when I picked up AxAx as BB. I raised pre-flop to 2,000 and only one stayed in. The flop was jack-high, I bet another 2,000 and my opponent folded. R told me he folded jacks to my raise. That put me up to 15,225 by the 35 minute mark. Called 225 with K♦J♦ and whiffed the board, then folded to a river bet, then blew another 300 playing Ax2x (althought that wasn’t my worst play in this tournament with that hand). I lost about 1,000 chips over twenty minutes. Dumped another 750 chips raising to 350 with AxTx. I had a wheel draw on the turn but missed. Just after an hour of play I was back down to 13,400. Set-mining with 6x6x as SB is dangerous work! Don’t call 600 pre-flop with it. It isn’t worth it. 8x8x as BTN, on the other hand, proved profitable when I re-raised to 1,100, made my set on the flop, then won with a 2,200 opening bet post-flop. Twenty minutes after the hour I was up to 13,975. With A♠Q♣ I raised to 2,000 pre-flop, getting two callers. There were two spades on the jack-high flop and I opened for 1,300. 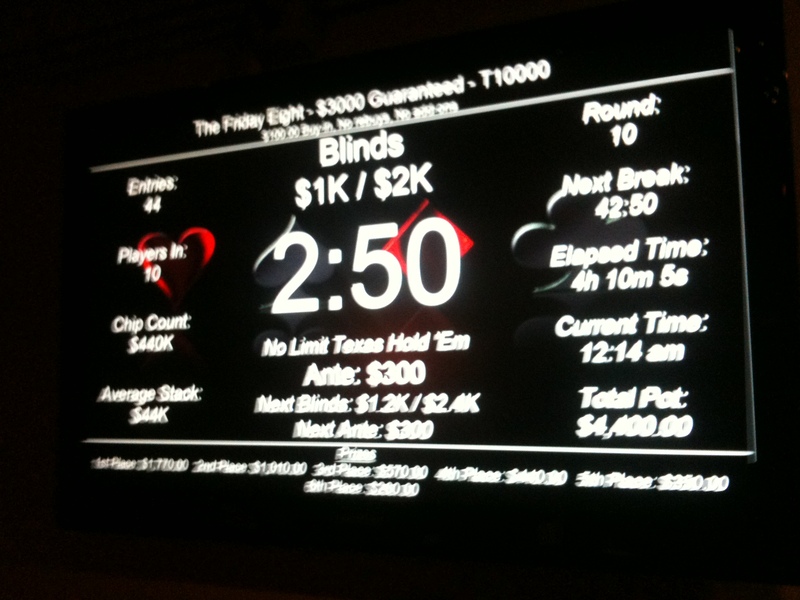 I was min-raised, then action came to a halt when the player to my right went all-in for more than 14,000. I thought about it briefly and laid down my hand; everyone else did so as well. The winner showed JxJx for top set and took in a big pot. I, on the other hand, was down to 10,400 at the beginning of the first break, so I almost doubled my stack by buying the 8,000 chip add-on. Set-mining with 7x7x is dangerous work (see above). 1,500 chips worth of dangerous. Speculating with K♣6♣ is 500 dangerous. From 20,000 chips (12,000 starting stack plus 8,000 add-on) at the two hour mark, I was down to 16,300. Things looked up a bit when I called 1,200 holding A♣6♣ and the flop was all clubs. Heads-up after the flop, I bet 1,200 after my opponent checked and took the pot. At two-and-a-half hours I held 17,400 chips. R remarked that I wasn’t holding onto many hands, which is when I coined the title for this post. Then I lost 2,400 with JxTx, which is usually a good performer for me. Last hand of the game was a highly speculative A♠2♣. The flop made me straight possibilities: Q♣4x3♣. The only other player in the hand was pushing hard, and I pushed back, eventually going all-in. Then the turn improved me to a flush draw: 9♣. Then I connected to my flush with 4♣ on the river. Unfortunately, what the other guy was connecting to with that card was a more powerful full house because he had QxQx in his pocket. R said he thought I was getting frustrated. I don’t know. I didn’t feel frustrated, I just thought I had an opportunity with that hand to do something before my stack got so small from blind attrition that I’d always get called. If my opponent had a pair instead of a set, he might not have called the all-in. DV lasted a couple hours longer than I did. I swung back by the club to see if there was anything I could get him about an hour after the last I’d heard from him, but he was out by then. R was there but wasn’t in the tournament any more. Three hours. Placed seventy-first of 93 entries. Fourteen places paid, with $15,000 in the prize pool.